What a week. We have been performing miracles for our clients both old and new. Within 5 hours we worked with a client finding an item in the $1 range that could be imprinted locally and picked up to save both time and money. We turned to one of our loyal and trusting suppliers that we knew we could count on and came up with this item. 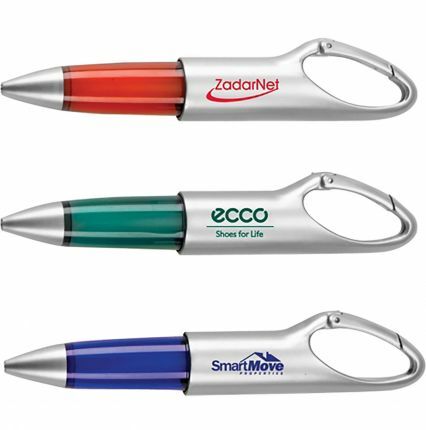 A carabiner pen that would write well and be able to clip on a bag or badge holder. Everyone was extremely happy with both the quality and service. Thank you Lanco! The next day another project came upon us. A 4GB flash drive that could be imprinted and delivered within 3 days. Another one of our trusted suppliers located in the next state was able to supply us with the exact flash drive our client was looking for. We re-created the artwork to be in a printable format, then imprinted the flash drives which will be delivered by tomorrow. Thank you Leeds! Do you have a project? Budget you have to work with? An impossible timeframe you wonder if anyone can help you with? Don’t hesitate to contact us. We love a challenge.